King Cole, the “father” of Expo ’74, who believed long before most everyone else that Spokane was big enough to host a world’s fair, died Sunday. He was 88. “King Cole was a primary force in the conception and staging of Expo ’74 and the resulting resurrection of our central business district,” said David Rodgers, who was mayor of Spokane during Expo. During its six-month run, from May to November 1974, more than 5 million people visited Expo ’74. The world’s fair site is now Riverfront Park. Cole was born Feb. 10, 1922, in Grand Junction, Colo. In 1963, Cole, community development director in San Leandro, Calif., was hired by the business group Spokane Unlimited to help jump-start Spokane’s lagging economy. Railroad yards obscured the Spokane River falls that flowed through downtown. Cole and his wife, Jan – and their eight children – settled in, and Cole got to work shaping a new image for Spokane. “Shortly after I arrived in November 1963, I was standing in line at the old Payless drugstore downtown waiting to pay at the cash register,” he recalled in 2008. Plans for the urban renewal of Spokane, in the guise of a world’s fair, began in earnest in the late 1960s. Cole traveled 700,000 miles in three years, garnering support from local, state and national leaders and the Bureau of International Expositions. He also helped broker the deal between the city and railroad officials who agreed to a land swap for most of the needed property on the Spokane River downtown. His favorite memory of Expo ’74 happened before it even opened. 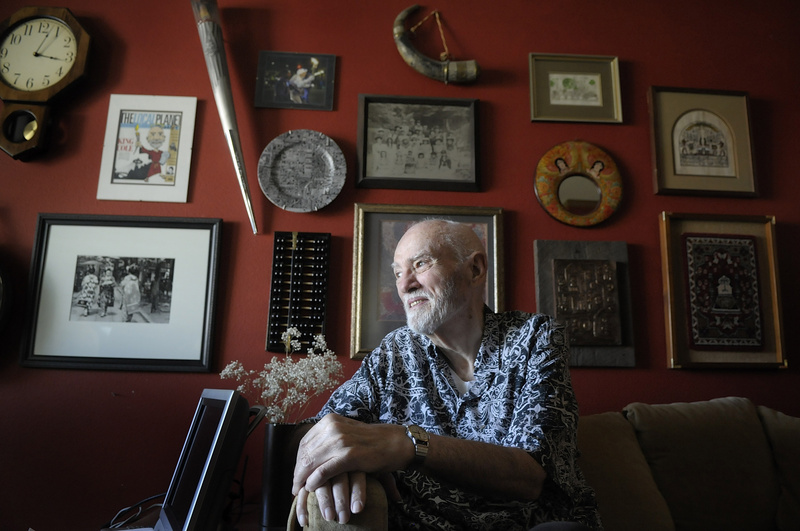 Cole, whose official title was president of Expo ’74, remembered: “I had to go under train trestles to get to my office at the Paulsen Building. I went under the first trestle and under the second trestle and one morning the third trestle, the one on the fair site, was gone. Expo ’74 opened May 4, 1974, to a crowd of 85,000. Speakers included President Richard Nixon, Gov. Dan Evans and Congressman Tom Foley. The event pumped an estimated $150 million into the local economy and surrounding region. Cole, who had studied for the priesthood in a Catholic seminary for seven years before deciding against that vocation, said the training came in handy once Expo was in full swing. After the world’s fair closed, Cole opened a consulting business, King Cole of Spokane Inc., and later served as the executive consultant for the Knoxville International Exposition in 1982. Until that year, Spokane was the smallest city to host a world’s fair. In his later years, he suffered with chronic pain and numbness from peripheral neuropathy, but he always said yes to interview requests from historians and journalists. Two years ago, Cole broke a hip and depended on a wheelchair to get around. His daughter, Lisa Taylor, said he loved when his grown children drove him through downtown Spokane in these last years. Cole is survived by wife Jan, eight children, 17 grandchildren and eight great-grandchildren. “He was going to be a great-great-grandfather in May, and he was waiting for that, because it was going to be five generations of Coles,” said daughter Mary Cole. Vigil service will be Wednesday at 7 p.m. at Our Lady of Fatima Catholic Church, 1517 E. 33rd Ave., with a funeral Mass on Thursday at 10 a.m., also at the church.